First of all, I would like to tell you that I did not know about this program much. At the beginning, Bank asked me to join the trip to Khonkaen and telling me some primary information, so actually I knew only the schedule. Until March 9th, I was so excited about joining this trip. In my daily life, I do not always speak to strangers that might because of my shyness. I realize I am not good at speaking English, so sometimes I do not know how to speak or explain something clearly. I hoped I could get along with others. I had been studying Japanese language for two years and passed the Japanese Language Proficiency Test Level 3 last year. However, I need more opportunities to improve my Japanese speaking skill. This cross-culture leadership training camp is a great chance. I tried to speak Japanese with some Japanese friends and some of them tried to speak Thai. That was really great. During this trip, we talked a lot about many topics such as music, celebrities, sightseeing and the seminar activities. Professor conducted us a lot of games. At first, I did not know what did them for, but now I know. The first activity was to introduce ourselves and remember the name of all trip’s members which were not that hard for me. Anyway, this activity did not make me know only the names but made me know other people more than I can see. After we reached the seminar room at Charoen Thani Princess Hotel in Khonkaen, we started other activities. To begin with, lining ourselves in circle started with people whose name begin with A alphabet and finished with Z named people, lining the circle started with the tallest person to the shortest person and to get information about your couple friend from him/her as much as you can by not speaking. These games would be easier if we could speak but this makes me realize that speaking language is not our problem in communicating with foreigners, body language and your heart which try to understand the others are more important. The BaFaBaFa… thing was also the most interesting game in this seminar. The game showed the difference of the two land’s cultures. We were separated into two groups called Alpha and Beta. We both had our own way of life. After that, Professor let us decide which land we want to live. This was really hard but I chose Alpha. I just want to live simply, I do not like the way Beta land is though nowadays my real society is also be that way. I do not like Alpha land only about the women’s right. Sexual equally should be in every society. Anyway, most of the participants chose the beta one but I was not be surprised. Last night in Khonkaen, we went to karaoke. Everyone seemed to have so much fun there. I could see smiles on everyone’s faces. I believe that “Music is the global’s language.” , don’t you think it is true? I expected we could have such a happy time together again someday. Moreover, sightseeing in Laos was very impressive for me, thus I have been there once when I was young. To sum up, the cross-culture leadership training camp taught me to try to speak more to make it easy to understand by the others, especially the foreigners. Furthermore, friends from many countries in the world is the one I achieved from this trip. I will keep contact them as long as I can because friendship is one of the most potential things in our lives. I think I am the lucky girl that was selected to join this memorable trip. I wish I could have chances to join other trips. The world what is today, will it be for tomorrow? This question should arise to each and every individual of this planet. The rapid modernization is also not only the worldly activity, but also degrading environment, losing one’s precious culture and identity, increasing global warming, huge disparity of income distribution, increasing social problems, nuclear war and so on are also part of it. Engulfing desire of the capitalism has far reached the heart of every people of the peaceful country. It enrages the soul of every innocent lives of the planet. So much in so, it is of immense need for the younger generation of today to witness the rapid changes, be it positive or negative, very closely. The change can far be faceted through opening one’s eyes to the outside world. The Sing Out Asia, Japan and OCA of Chulalongkorn university, Bangkok has jointly organized a trip on Cross-cultural experience. The participants were students from Bhutan, Cambodia, Japan, Lao, Thailand and Vietnam. There were a total of 30 students which took part in this trip. In detail, eight from Japan, five from Vietnam, four from LAO PDR, eleven from Thailand, one from Cambodia and one from Kingdom of Bhutan. It was a good mix. Each represented as ambassador of their country imaging their country’s culture, value and etc through each of participant. The journey began from one of the biggest international airports of Asia, Suvarnabhumi airport at Bangkok on 9th March 2008. All students greeted with great smile in their face and cheerfully got into the tour bus which will be with the team till 13th March 2008. I wondered whether it was an Asian culture that each ambassador instead of mixing with others instead took the seat with their own mates. Well, I silently questioned myself the theme of cross-culture. I at the same time answered myself that it might be owing to the first day of the trip and strange to everybody. Then, reached first halt of the journey, putting up at Sima Thani Hotel at Nakhon Ratchasima, in olden days it known to be Korat. Everyone was invited with a juice in the hotel and a sumptuous buffet dinner. Everybody was enjoying the dinner as I enjoyed. Thereafter, all visited one of the most historical sites of Korat. In the mid of the back to the hotel from the visit, all other participants excepting Japanese and Bhutanese stopped to mesmerized in the night club at Korat. The second day and the destiny of the trip was Khonkhaen. It is one of the fastest growing cities of the north-east Thailand. Thanks to khun Yai, the journey was livelier this time. He initiated an idea of introducing each of the participants by appearing at the front of the audience in the bus. It was perfect time for this timely initiation before halting to visit a model of Angkarwat monument of Cambodia. Everyone was excited and took as many pictures as they can. It was more exhilarating. I enjoyed listening to the melodious voices of the participants singing their songs. For the first time in my life, I sang. I drew an inspiration. Seems everybody’s stomach was grumbling as their energy was exhausted. So rightly, the bus stopped for the lunch. The journey resumed. It is universal culture, I guess so. After lunch meal, it turns to be silent once again. I accept the fact. Even I retired to keep silent by enjoying the nap in the bus. The next halt of the second day of the voyage was at Khonkhaen. Everybody got out of the bus and rushed to the hotel room. The participants were given ten minutes before joining the conference room. The team was joined by two female and male friends from LAO PDR. Before session began, all participants were greeted with each other by serving them with tea and snacks. The session began by introducing each of the members. I could notice one thing in common was the smiling face in every face. Also everybody was happy to join the trip. Even, I am more privileged to have joined this trip. I sincerely thank Ajarn Buddhagarn. After having introduced, the floor was taken over by Mr. Hatano, Director of Non-Profit Organization in Japan. I was really glad to know that it was the second generation to take part in this exchange programme. Meaning that, the same was conducted three decades before. Again I was striked with a question in my mind, will it continue on and on? It was wonderful time that we could get to know some of the cultures of the each country. We joined for dinner at the lobby in the hotel. The name of the hotel was Chareon Thani Princess Hotel. After dinner, everybody was gazing at each other asking about the next plan. Thanks to our Thai friends. They managed to take all the participants to a Rad night club. It was great fun for me. Hopefully for others too. Third day of the trip was resumed at conference room of the hotel after lunch. As usual, Mr. Hatono enthusiastically took over the floor. The session began by introducing a card game. Was it a gambling? Interestingly, it is deeply impacted with different culture in each country. It was interpreted by splitting the group into four. I came to know although it is a card game, but each group played the same card game differently. The next game was infact more informative to me. 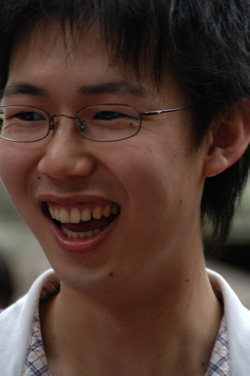 The group was divided into two and Mr. Hatano and Ajarn Yai lead a group each. I was in Mr. Hatano’s group. It was really interesting and enhancing. Each member of the group was made to visit other group and was to analyze the culture of the group. We came to know at the end of the game that a group was capitalistic and socialistic driven economy respectively. Each member was asked to make a preference about a group and majority of the members chose socialistic economy. I was extremely happy to know that still the younger Asians were not influenced much by the materialistic desires. It was great time to have dinner at classic restaurant which captured the heart of all the members by the site and structure of the restaurant. The members split visiting different night clubs at Khonkhaen. Fourth day, it was scheduled to travel to Lao PDR. The journey began at 9’0 in the morning. It was almost three hours drive from Khonkhaen to Nongkhai. Nongkhai is the province of Thailand which share borders to the Lao PDR. Mekong River serves as the natural boundary between two countries. We stopped for lunch before heading to enter the jurisdiction of Lao. It was the last lunch for all participants in Thailand to have it in a group. After lunch, Ms. Mai and Ms. Yud managed a motorbike to proceed before to process for re-entry visa in Thailand. I truly appreciated their courtesy and hospitability. Actually, in Bangkok, I chose motorbike as the last option to ride. However, it gave me an interesting short journey by motorbike. Lady driver was happy that I was the first guy from Bhutan riding on her bike. She even knew the name of my king. She time and again reminded to feel safe and comfortable on her bike. I left up to her and to my Tripple Gem. Safely I reached her shop. I felt sorry, that I was already full, so I could not buy something to eat. I shall always treasure her kindness. Then, again from that point, I again have to ride in different bike and lady driver. This time, I could have no more conversation. Does it sound rude? My lady driver this time couldn’t communicate in English or I could talk Thai. I somehow know know to say in Thai “phoot Thai nit noy”. Thai assuming that I speak Thai, they speak in Thai and again atleast I know how to say “mai kawjai”. However, I promised myself that before I leave Thailand, I at least would learn to speak Thai. We reached the Immigration Office of Nongkhai. It took less than five minutes to process for re-entry visa. Then we headed to the border. I waited for the group to arrive. I could witness that many foreigners visit Lao. The bus reached after half an hour later. The participants have to walk to next gate. Then we climbed in the bus and headed towards Lao. It was really mesmerizing for all non-Laotian members to enter a new country almost for everybody. I am very much grateful for the sponsor of the programme. I could this time reach to a new country, Lao PDR. This trip shall unforgettable trip in my life. 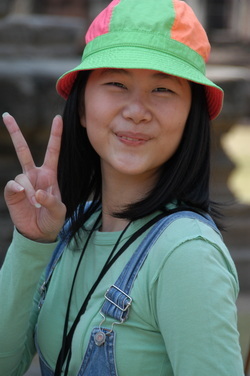 We were welcomed by a Laotian tour guide whom I know her by nick name, Nying. In my national language in Bhutan, Nying means ‘heart’. It sounds cool. She was pretty and welcoming. She introduced us to some of the most historical places in Vientiane, capital city of Laos. We were put up in Don Chan Palace Hotel. This is the highest building in Vientian which is fourteen storied. I came to know through one Laotian participant, that the municipal allows building to a maximum floor of seven. Vientian city is growing; many overseas investors are crowding in. Hopefully, it will have strong positive impact in the Laotian daily lives. On the fifth day of the trip, we visited some of the most important places in Vientian. I and my fellow friends offered prayers to the statue of Lord Buddha. Then we headed to some of the shopping malls of Vientian. We then joined for the last lunch at International airport of Laos. We enjoyed meal. 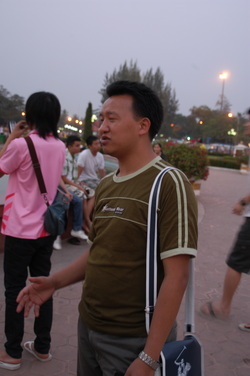 Mr. Lang from Lao departed from the group. He was a talented and popular singer and model in Laos. After which, we rushed to Udan Thani province of Thailand to catch flight to Bangkok. Time was so crucial this time. It was just twenty minutes left for flight take off when we reached Udan Thani Airport. I felt sorry that I could not see off Laotian, Cambodian and Vietnamese friends. However, Mr. Ta, Ms. Tai and Ms. Nok from Laos, Mr. Nara from Cambodia and Ms. Thu Chi shall always be remembered. We had great time. We departed from our speechless creature but gave us comfort and lively journey, BUS. Then we bid farewell to Ms. Mai. An hour later, the flight landed at Don Mueng Domestic Airport at Bangkok. It was hassle free as we need not stand in queue for immigration check up. This was the final last moment to catch the glimpse of all my friends. I shook my hand with Mr. Sunisho and Mr. Masaya from Japan, waved my hand to Ms. Mika, Ms. Chika, Ms. Arisa, Ms. Marie, Ms. Yukari and Ms. Aya from Japan. I also shook my hand with Mr. Tiep, Minh, Binh and Ms. Uyen from Vietnam. I waved my hand to Ms. Jui and Ms. Pod Duang, Mr. P, Mr. Jho, Mr. Pond, Mr. Nokweed, Mr. Na, Mr. Bank, Mr. Boom and Mr. Ake from Thailand. I finally shook my hand with Mr. Hatano and Ajarn Yai. I sincerely thank the sponsor and organizer of the trip and in particular, Ajarn Budhhagarn who offered me an opportunity to join the trip. The last question arose to me was “Is this the end of the beginning”. My answer was this is just the “beginning of the end”. So I look forward for similar voyage in days to come.